Change things up with these side-trips from Split: Trogir (Trogir Square & Trogir Historic Site). There's much more to do: delve into the distant past at Diocletian's Palace, take in the awesome beauty at Marjan, admire the landmark architecture of Cathedral and Bell Tower of St. Domnius, and admire the masterpieces at Ivan Mestrovic Gallery. To find more things to do, ratings, where to stay, and other tourist information, read Split trip generator. Amsterdam, The Netherlands to Split is an approximately 6.5-hour combination of train and flight. You can also drive; or do a combination of train and bus. Expect a bit warmer temperatures when traveling from Amsterdam in July; daily highs in Split reach 36°C and lows reach 24°C. Finish your sightseeing early on the 9th (Sun) so you can take a bus to Bol. On the 10th (Mon), take your sightseeing to a higher altitude at Vidova Gora and then enjoy the sand and surf at Zlatni Rat Beach. For maps, ratings, traveler tips, and other tourist information, go to the Bol sightseeing planner. Traveling by bus from Split to Bol takes an hour. Alternatively, you can ride a ferry; or do a combination of car and ferry. Expect slightly colder weather when traveling from Split in July: highs in Bol hover around 32°C, while lows dip to 26°C. Finish your sightseeing early on the 11th (Tue) so you can ride a ferry to Hvar. 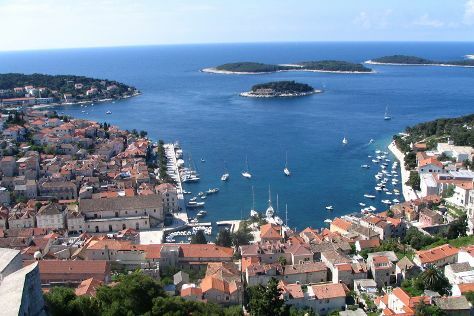 Hvar is known for sightseeing, nature, nightlife, beaches, and adventure. Your plan includes some of its best attractions: steep yourself in history at Spanjola, step off the mainland to explore Jerolim, admire the landmark architecture of Franciscan Monastery, and stroll through Dubovica. To see photos, ratings, more things to do, and tourist information, refer to the Hvar custom trip planner. Hvar is very close to Bol. In July in Hvar, expect temperatures between 32°C during the day and 26°C at night. On the 13th (Thu), wrap the sightseeing up by early afternoon so you can travel back home.